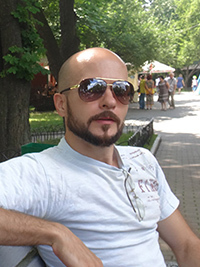 Sergiy M. Yurchenko, Freelance 3D Artist & Designer. Author of the Studio 3D Graphics & Design “Monaco Felice”. Sergiy M. Yurchenko — freelance 3D artist and designer. Author of the studio “Monaco Felice”. I greet you in my art studio 3D graphics and design “Monaco Felice”! My name is Sergiy M. Yurchenko. I was born September 20, 1981 in the family of the artist. The town of Pryluky in Ukraine. A few words about my education. Back in school years I liked to redraw interesting pictures from print publications — drawing an ordinary pencil, also tried oil painting and pastel. As a result, several works of my creative activity, have been sold in the local art salon — it was pastel landscapes. Since my father was a painter and a sculptor, all the basics of drawing and fine arts in general, I learned from him. Computers I studied independently. It was a long creative way — after moving to Kyiv (2001), I had to work a courier, layout artist of outdoor advertising and also I was the installer of this advertising …eventually I earned money for my first computer! After that I bought literature and began to study computer graphics. I worked as a designer of outdoor advertising, was preparing of graphic images for the thermal printing on fabric, developed the design of printed products for advertising agencies, as well as souvenir products and design of exhibition stands. After 5-6 years of experience in various companies, I have come to two more specialized directions - Web design and 3D graphics. And in early 2007, I decided to engage computer graphics as an independent expert - I became a freelancer. Currently, I live in the United States, and the focus of my professional life is on a 3D graphics — including polygonal modeling (Subdivision Surface Modeling), digital sculpting (ZBrush), product and architectural 3D visualizations. “Mónaco Felíce” literally translated from Italian means «happy, successful monk». From of those times originates the name “Mónaco Felíce”.